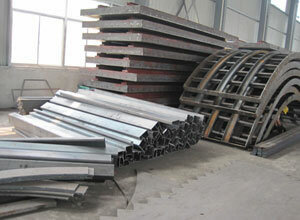 The steel formwork is also called tunnel formwork which can replace wood formwork. It dramatically reduces pore water pressure that wooden, plywood, steel plate or other traditional materials can not get rid of. The steel formwork can form any shape to meet the need of an urgent capping. Working can be quickly recovered, so there is no need to remove the formwork. This steel plate doesn't require any scabbing and can be installed directly. This machine can be set before or after installation rebars. It can be inspected during pouring process and reduces the risk of holes and honeycomb structures. If there is something wrong during the pouring process, the high ribbed formwork will be an idling device. Made in steel protection, this high ribbed formwork is a fast solution to offer proper protection. We are a manufacturer and supplier specialized in steel formworks in China. Our company is involved in research, production and sales of steel formworks. Thanks to their high quality and range of size, our products have earned a great reputation both in China and abroad. With more than 20 years of expertise, our products have been exported to the United States, Canada, Germany, France, Spain, Italy, Switzerland, Norway, the Netherlands, Russia, Australia and many others. The precision of our testing and production equipments, and also our skilled workers guarantee a good control of our products. We can, of course, also provide OEM services. If you need steel formworks, do not hesitate to contact us.